Now in its 58th year the Pin Mill Sailing Club Barge Match, to use its correct title, was first organised as a class within the Pin Mill Sailing Club regatta, it was so successful that the decision was taken to run it as a separate event. This proved to be a fortuitous decision as up to 21 Barges have taken part over the years. The original Barge Match Secretary Jack Haste ran it for the first 30 years until he retired, handing over to me for the 31st. 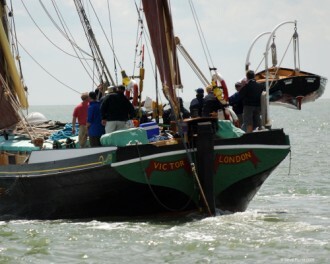 My love and involvement of Sailing Barges (or Old ladies of the Sea) originates from my youth living in Leigh on sea. I used to watch them with my Mother, looking from the Marine Parade over the Thames from Canvey Point to the Pier, in those days some were still trading. I always remember a year or two after moving to Chelmondiston in the late 1970s, taking a walk down to Pin Mill one Saturday evening, only to be met by the sight of at least 15 Barges moored on the Hard, I was hooked again! Hooked so much so that on joining PMSC, I volunteered to help Jack run the match, not knowing that he saw in me his exit plan! but not until I had served my “apprenticeship”! I took over in 1992 and during my time I have seen a number of major changes. When I took over most of the Barges were owned and run by large corporations, with full time skippers and mates, and were used for corporate entertainment. Cost cutting and the need for lean balance sheets has seen this swap round to the vast majority being privately owned and mainly used for charter work. To this day there are at least three Barges that have not had engines added and remain totally dependent on their sails. We have had to reflect these changes in the Barge Match by introducing a ‘following class’ to allow Barges that do not actually race but can follow the match with a large number of spectators on board. This means that many of those Barges embark and disembark from Ipswich, where customers can “walk on”. Unfortunately for Pin Mill this has meant fewer Barge owners are interested in coming on to the Hard, however the Pin Mill Bay Management Community Interest Company does try to encourage this grand sight by inviting Barges to moor for free on the Hard for two weeks around the time of the match. In addition the communal floating Pontoon provided by Kings Boatyard and the CIC has allowed Barges to have much easier access, with the Barge Tenders being able to embark and disembark their passengers straight onto the dry pontoon. The C.I.C. will continue to work with the organisers of the Barge Match to support and encourage the preservation of these beautiful vessels. There used to be a Passage Match from Gravesend to Pin Mill which acted as a feeder to bring the Barges up to the Orwell, but this has now become a rally from the Medway the week before the Barge Match. However, it does mean that we can enjoy the sight of the Thames Barges in the Orwell before and after the match date. The Pin Mill Match is one of a number of matches throughout the sailing season, with a Championship being decided by points allocated from each match and awarded by the Sailing Barge Association. Other matches are The Thames, Swale, Colne, Blackwater, Medway and Passage rally, there was no Southend Match in 2018. As with all things in life, health and safety has also had a major impact, with Passenger carrying Barges having to hold exemption certificates from the Marine and Coastguard Agency, and limited to numbers of passengers they can carry, as well as how far from shore they can sail, all of which means the setting of a course for the Match is a challenge to be faced on the day, along with taking into account the weather! For this reason we do not announce the course until about ½ an hour before the start. It’s interesting to note that some of the Barges are actually people’s homes and that many have now sailed for three centuries. We are fortune to have the special event of the Barge Match in Pin Mill and get the pleasure to witness the spectacular show of these ‘old ladies’ of the sea.